Better Forest Tree Seeds takes great care to ensure that quality control measures are taken with each batch of cones collected. We record the exact forest location of all cones collected. This information follows the seed throughout production and is recorded for follow up performance evaluations. We take every possible precaution to properly handle our seed. Our cones are given the proper after ripening and then immediately dried to reduce mold build up. 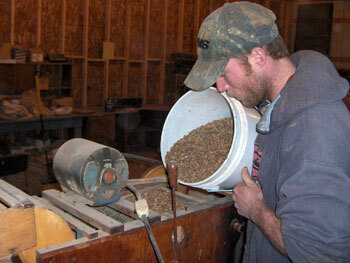 The seed is then extracted from the cones and put through a series of machines to aid in increasing seed quality. 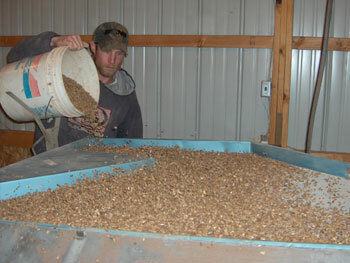 All seed is cleaned to a minimum of 97% purity with 99% being our goal. The seed is then tested for germination capacity and moisture content before it is sold or stored. All seed is stored in sealed containers and held at 5 to 10 degrees Fahrenheit. Please be assured that all seed lots are tested for actual germination once per year. At the time of sale, you will be provided with the seed batch number and all necessary information to correctly sow it in your nursery, from germination to seeds per pound. We do import and broker some seed lots. When these batches are received we test and reclean the seed if necessary to increase its quality to meet our tight standards. Please feel free to follow up with us at any time regarding seed quality questions. We take pride in providing you with the highest quality seed on the market. 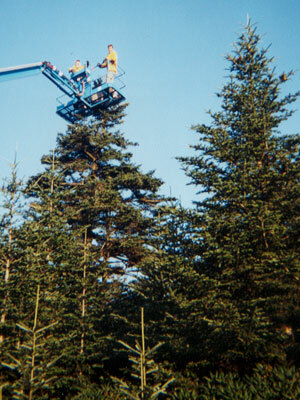 Bob and Chris collecting Fraser Fir cones on Roan Mtn., North Carolina. Rick running seed through our small clipper machine to help fine tune seed purity. Rick running seed over our gravity table to separate the hollow seed from the viable.